Dirty Gourmet is three women—Aimee Trudeau, Emily Nielson, and Mai-Yan Kwan—who came together after a bike tour across Canada. They put together a big variety of camp meals, many of which can be found in their cookbook of the same name, with lots of different cultural and taste influences. 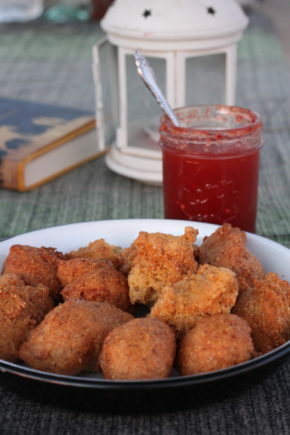 This recipe, from Emily, for easy hush puppies, is a great dish to serve around the campfire on a cold evening. Though I spent only a little time in New Orleans in my life, Mardi Gras has always been big for us. My mom was born in New Orleans, and my dad worked at Universal Studios when I was a kid, so I was often lucky enough to get to ride the Mardi Gras floats through the park, flinging beads. We are always cooking Southern food around here, so we finally did a Southern menu for our last event, the Subaru Death Valley Cycling Adventure. We made jambalaya, greens with lemon-tahini dressing (adapted from one of our favorite books, Bryant Terry’s Vegan Soul Kitchen), and these hush puppies. It was about 15 degrees outside in the backcountry of Death Valley and the mountain bikers had been out riding fully past dark by the time they returned to our camp. They were ready for a hearty meal. The crew was a mashup of different people with different needs, so we were happy to have stumbled upon a vegan and gluten-free method that tasted good to everyone. We planned to use hot pepper jelly as the dipping sauce for these but forgot it (and we weren’t about to drive four hours back to town to pick some up). We did have some cactus jelly that we’d purchased (along with a rattlesnake mug) at a gift shop on our way in. We mixed it with the Tabasco-laced pickling juice from the spicy okra on our appetizer tray, and it was pretty delicious. The “recipe” isn’t included, but play with combining some kind of pepper jelly with some cider vinegar and salt and pepper to create your own dipping sauce. We discovered that the desert is the perfect place to fry. An outdoor kitchen can handle the smoke and grease much better than an indoor one, cast iron is often readily on hand along with a strong stove flame, and people will flip out with excitement when they get to eat your creations. Just remember to bring some kind of container to pour your oil into when you’re done frying. It’s also perfect, of course, for a cold weeknight celebration. Use these puppies as an excuse to eat outside in February. Combine cornmeal, flour, salt, black pepper, garlic powder, baking powder, and sugar in a ziplock bag or a container with a lid. In a medium bowl, combine the ground flax seeds with the water. Mix well and set aside for a few minutes. Meanwhile, heat 2-3 inches of oil in a medium pot. Add the soy milk, cider vinegar and olive oil to the bowl. Allow to rest for a couple more minutes. Add the cornmeal mixture and mix well. Drop batter by the tablespoon into the hot oil. Fry in batches until the puppies are golden brown, turning to ensure that they’re browned evenly.